Bangkok resident and expat angler Brendan visited the highly prolific Bungsamran Lake in Bangkok. Fishing to a heavily prebaited area close to a bungalow the angler captured several large Mekong Catfish with weights to 30kg’s in addition to Striped Catfish to 12.5kg’s. Brendan used conventional tactics to capture his large haul of Catfish using buoyant hookbaits fished in conjunction with large method feeders loaded with local groundbait. The highly adventurous Brendan decided on a change of tactics and changed hookbaits to 16mm HBS Supa Stench pop-up boiles. After a quiet spell Brendan’s pop-up hookbaits were picked up by a Giant Siamese Carp of 20kg’s which was beaten after a fifteen minute battle. Soon after another of the anglers pop-up hookbaits was picked up by a massive Chaophraya Catfish which regretably fell off just as it was about to be netted. 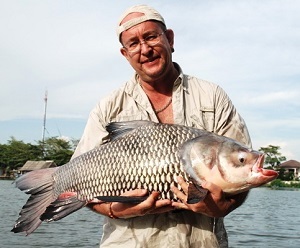 Brendan continued to fish for a few more hours and steadily caught more catfish before once again his pop-up was picked up by another Giant Siamese Carp of 19kg’s.